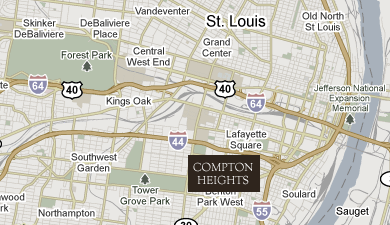 Welcome to Compton Heights Online! A vibrant Saint Louis neighborhood with a diverse community, stunning architecture, rich in history, and close to everything. Compton Heights, located on the near Southside of the City of St. Louis in the shadow of the great water tower of Reservoir Park, is one of the earliest planned residential developments of the American 19th century. Laid out in 1889 in accordance with a plan that viewed nature as neighbor and not as an enemy to be subjugated by some rectilinear grid, its wide setbacks and curving streets create remarkable vistas, which are punctuated by more than 200 homes of extraordinary and varied interest. The entire neighborhood is a local historic district. The people who live here are just as extraordinary and varied as the homes! The neighborhood is proud of its cheerful diversity and the range of talented people who have chosen to live in Compton Heights.